Buying food in bulk and preserving from your garden and farmer’s markets is as an awesome way to save money and capture maximum nutrition, but there’s even one more reason to love those frugal habits: they reduce waste and help save the earth, too. A 25-pound bag of dried beans uses far fewer packaging resources than 25 one-pound plastic bags, and the cans and shipping weight/fuel saved by making your own beans from dry has to be significant. 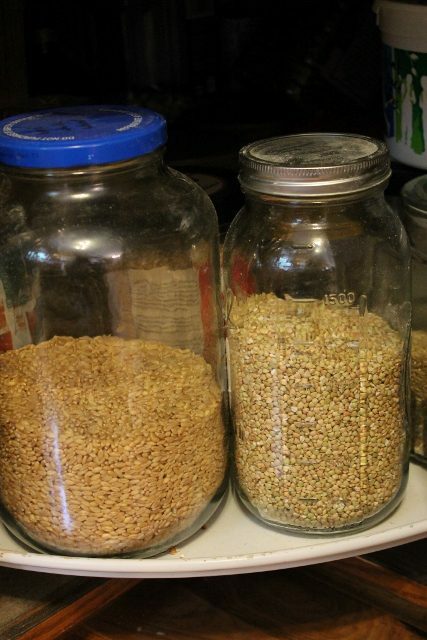 In my household, all the bulk foods I buy also save me numerous trips to the store, since I almost always have food in the house for plenty of meals without having to drive my van around and create pollution. 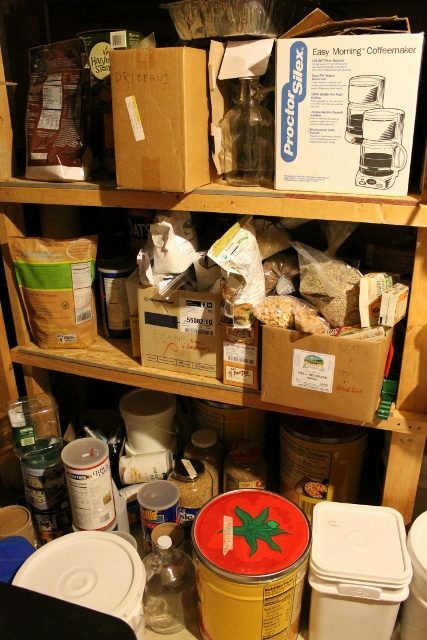 The last piece of the puzzle, then, is how to store bulk foods in the safest way possible, both to keep the food from spoiling or getting eaten by critters and to protect your family from potential leaching from questionable materials. For each of them, I have various ways to keep the storage organized, safe from mice and bugs, and easy to access. 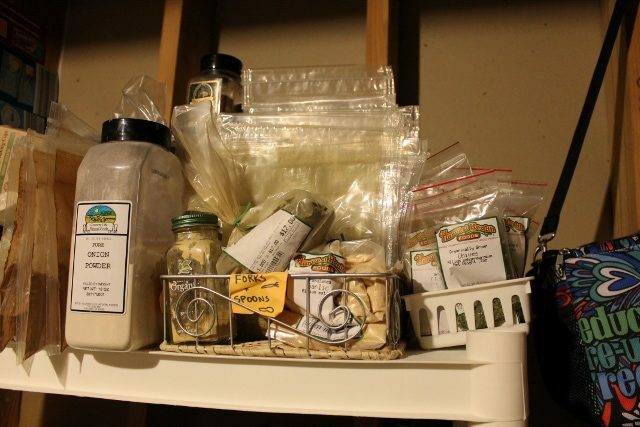 I’ll take you on a little tour of our food storage “area” – pardon the lighting in the pictures as there’s really no great time of day for a basement and natural light! 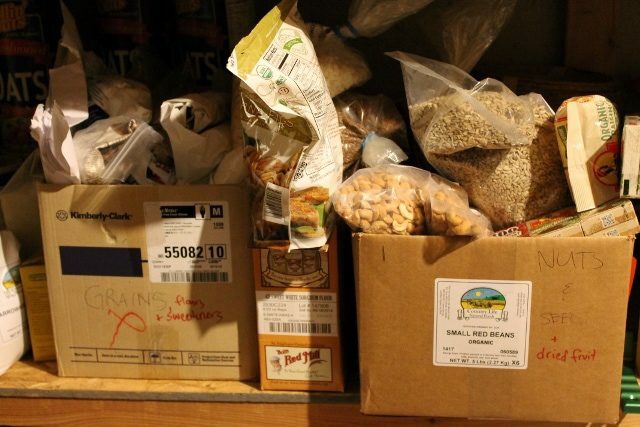 This is the whole scene, with some examples of very good and very bad food storage. Most of the whole grains and beans come in large paper sacks, a perfectly safe material for my family’s health, but not exactly impervious to bugs and rodents. 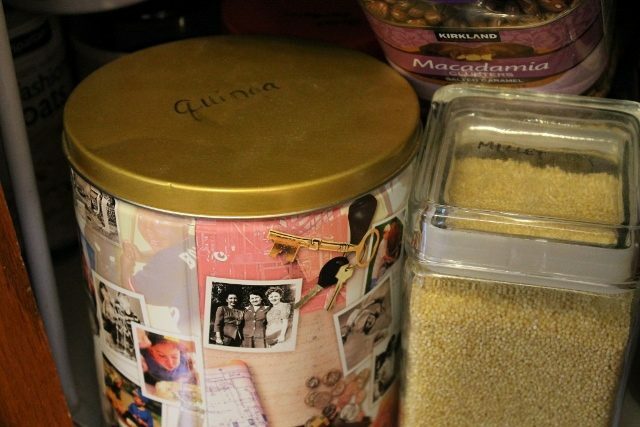 I prefer to sink those paper sacks into metal tins (like the Red Gold tins in the pictures, which were a freebie at some point – but you could also ask friends for the large popcorn tins that are so popular at Christmas time). I don’t worry about what the metal is made of because it’s not actually touching my food. Plus, as long as the bags fit inside the tins, I don’t have to bother with pouring and making a mess. I have also purchased some plastic 5-gallon buckets designed specifically for food storage. They’re not cheap, usually $5-6 apiece, but they are food-safe plastic and protect the food well from rodents, insects or moisture. I generally pour my dry beans into them, and although plastic always has questions about leaching, I can’t imagine that much could leach into dry goods. If you invest in the buckets, you must invest in the special opener as well. It’s possible to get into the buckets without one, but it takes about 5 minutes and no small amount of frustration and sore fingers! I also have a number of reused/reclaimed buckets from 10-pound purchases of Real Salt, bulk honey, and bulk coconut oil. I love being able to repurpose them well and store things like popcorn, homemade fruit rolls, and sweeteners I don’t use all that often. I’ve heard that some bakeries will allow people to take the large plastic buckets that frosting comes in, but I haven’t been able to work that out yet. I store some bags, particularly the 50-pound bag of oatmeal I’m known to invest in, in a large Rubbermaid tub. It’s possible pantry moths could get through it, and I’ve known mice to gnaw through them as well, but that was in a garage during a hard winter. It’s not a perfect solution, but at least the oats are safe from moisture and safer from critters. It’s the best I can do! 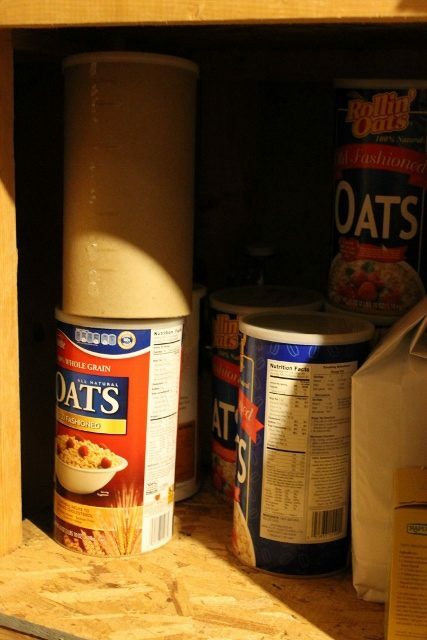 I store portions of oats for serving in the kitchen in old oatmeal canisters, which are certainly not safe from any of the three food disasters, but it’s a safe material, reused, free, and I’ve got to be able to access my oats without having to scoop from a huge bag every few days (we eat 5 cups at a time!) or purchase glass gallon jars at $6+ each. I only store them up off the floor, and any food on the floor is in thick plastic, glass or metal in case of a water problem in the basement. As for spices, I don’t repackage them until it’s time to refill my individual spice jars in the kitchen. I just try to organize them in alphabetical order so I don’t lose track of what I have – above are my two baskets, one for the wide bags from Penzey’s Spices and the other for the small one-ounce bags from our local health food store. I’ve never had a problem with longevity for spices, so I’m keeping my system for now. 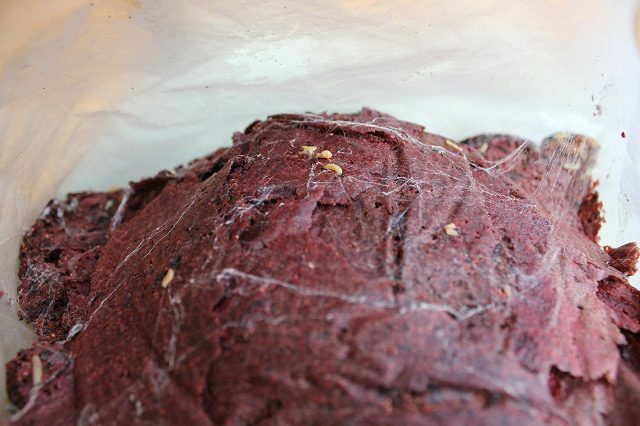 We had an experience I’d like to forget with some pantry moths last fall (above, my homemade dried strawberry fruit rolls and some visitors – feel free to cry with me! ), and I learned that a plastic bag is not a safe place for food if you have that sort of infestation. After that, I reorganized a lot of my dry storage, particularly in the kitchen, so that moths couldn’t get into anything anymore. A few purchased glass gallon jars, an investment, but nice for whole grains/beans – if you can get people at potlucks to give you the glass gallon-sized pickle jars, it’s a great freebie!! I don’t store everything very safely, I’ll admit. When dried fruit, sweeteners and nuts come in 5-pound bags, I tend to just pile them up in boxes in the basement labeled with the type of food inside (chaos, above). I try to keep nuts in the freezer whenever there is room. They’re in plastic, but I do freeze in glass jars for as many liquids as possible. I should get some more large plastic tubs and sink them all in there for optimal safety, but it’s just something I haven’t done yet. I do keep a pantry moth trap in the basement and check it every time I go in the storage room. I figure if I ever find a moth in there, I’ll get scared and repackage everything and hope I’m not too late! This is, of course, from my upstairs pantry where everything is under lock and key (i.e. hard plastic, glass and metal). Except for boxes of pasta. And bags of tortilla chips. If I repackaged everything, we’d never have time to eat! Price: Can I repurpose something I already have or get a container for free that someone else would throw away? Impermeability: Glass and metal are the best defense against moisture and critters. Hard, thick plastic is next, and plastic bags aren’t a very good choice at all. Ease of access: I need to be able to get into my food for regular use within seconds. Safe materials: Glass and paper have no known health risks, some metals are rated very safe/non-leaching (stainless steel, for example), and plastic should be number 1, 4 or 5. Other recycle numbers have been proven to leach into food. All plastic should be seen as questionable, however, because we simply don’t know yet what we don’t know! I try to only store dry goods in plastic because liquids leach at a much faster rate. 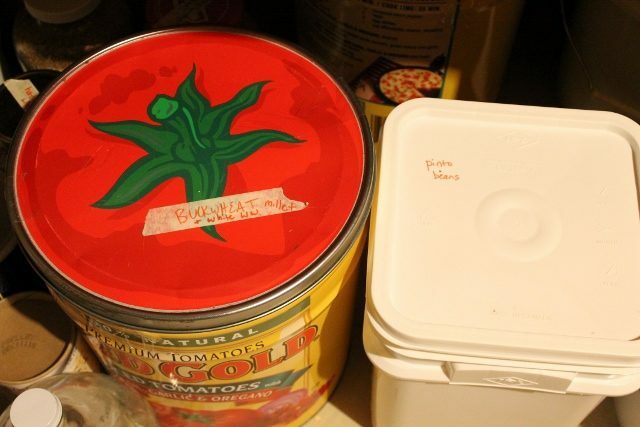 If you’re buying in bulk and storing food, remember to label everything and keep track of what you have, both so that you don’t run out without being prepared and so you can use the oldest food first and never have to waste your investment. 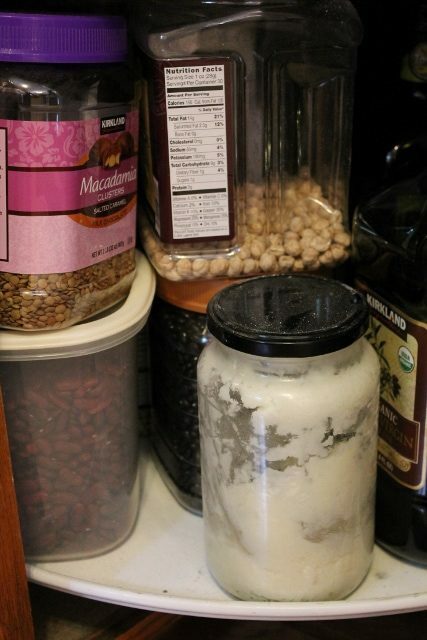 Look for part two of this idea – how to store food using less plastic – next month when we discuss the refrigerator and how to store produce and leftovers as efficiently as possible. 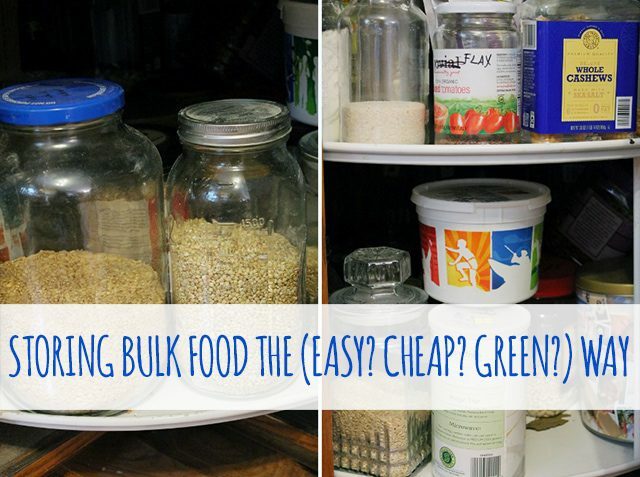 Do you buy in bulk? 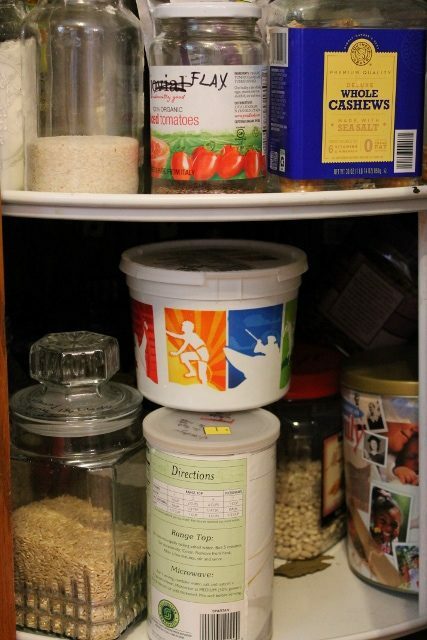 How organized are you with your storage – and how safe from the “big 3” food disasters? Katie Kimball has been “green” since 5th grade when she read 50 Things Kids Can Do to Save the Earth. She remains slightly disappointed that she didn’t actually save the whole thing back then, but now that she has 3 kiddos counting on her, she keeps plugging away hopefully. 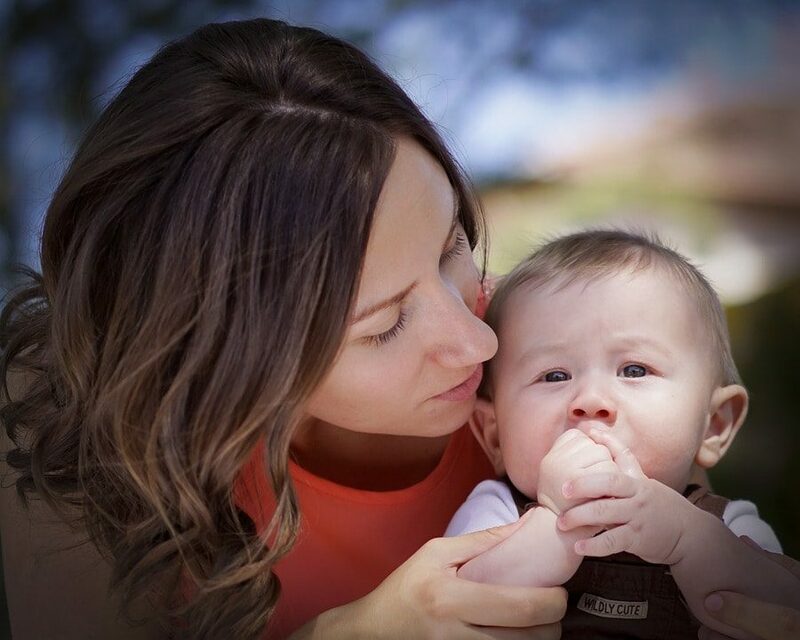 Katie blogs at Kitchen Stewardship about real food and natural living and is the author of Healthy Snacks to Go and other eBooks, available for Kindle. Previous PostThree More Things You Do NOT Have to Throw Away! I buy bulk spices and store them in 8 oz canning jars. Usually the jar holds the contents of the bag completely. I have come to hate refilling the little spice jars. Thanks for the other storage ideas! If you live close by a Pizza Hut you might ask them to save their gallon pickle jars for you. I have some of these and they are wonderful. I soak them in hot soapy bleach water and it takes the smell out *(also lids) and takes the labels off, leaving no stickiness! thanks for you good ideas. we also buy in bulk and appreciate everyone’s ideas. Before sending my grains and rice to their final storage spot, I freeze ziploc bagfuls of them for a day or so before putting them in glass jars. The freezing kills any pantry moth eggs. Haven’t had a moth incident in years since starting that routine. Super smart of you, Wendy! When I buy in bulk, I know there is always the possibility of weevils or moths, especially in grains. I store the grains in the freezer for a few days to kill any eggs or live bugs, then repackage and seal in plastic ziplock type bags so if something happens to one bag, it won’t necessarily contaminate all the product. I store multiple bags in food safe 5 gallon buckets. You can get screw on, reusable Gamma Seal lids that are airtight but easy to get off and on from Home Depot or Lowe’s. This is a great post Katie! I am going to pin it! Thanks for the tips! A bit of an aside… you mentioned buying honey from Country Life as well. Do you know if it is ‘really raw’ or do you buy it just for cooking, or do you not buy raw honey as its not so easy on the pocketbook. Thanks so much! Can you freeze crispy nuts (NT style)? Do they stay crispy? This is great advice! Very thorough. I have a similar informal system. I keep an eye on the recycling bins at work and church for good containers that might be discarded–people who aren’t really up on the recycling rules often leave the lid on, which is ideal when I want to snag the container! Two years ago we had a horrible invasion of big, strong, determined mice…just after we had bought 20 pounds each of rice and whole-wheat pasta and stored them in big plastic jars (from pretzels and cheez puffs other people buy at Costco) and plastic canisters with snap-on lids (from cheap coffee other people buy). The mice gnawed right through the coffee canisters! They had a harder time with the jars with screw-on lids, but they did get through a couple of them by starting from the ribbed base; apparently the ribs provide traction for the teeth. Ultimately we saved some of the big jars by putting them on top of the refrigerator. 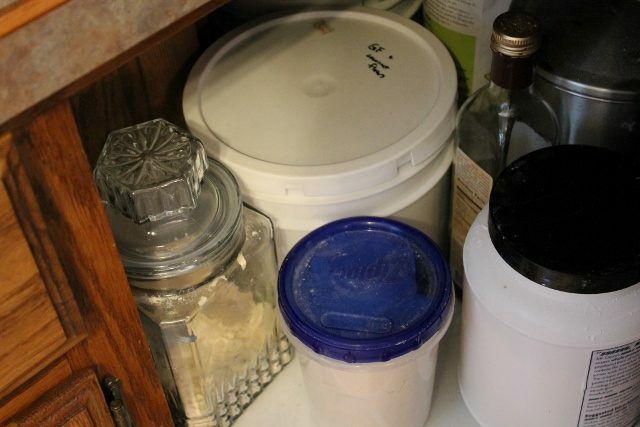 Now that we have vanquished the mice, I am using the screw-top jars, but I no longer use coffee canisters in my basement pantry, only in the kitchen cupboards which shut tightly and never had mice in them. Moths have gotten into the coffee canisters before, but not often, so I just do a quick check for webs when I open the canister. We even got those moths in a glass jar (of sunflower seeds) once, but I think the seeds must have had moth eggs in them when I bought them. A couple years ago, moths destroyed nearly all my beautifully home-dehydrated apricots. They chewed little holes right through the ziploc bags! 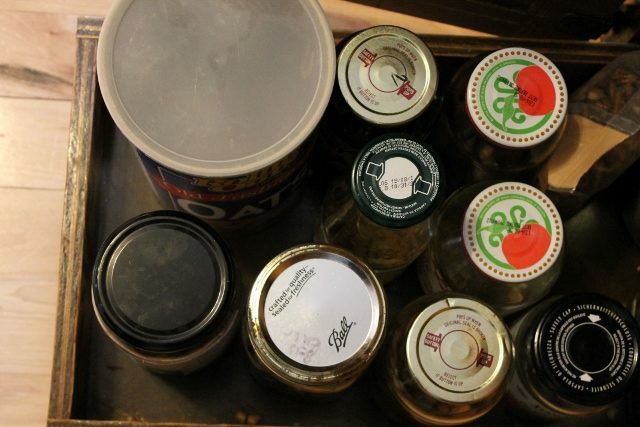 Learned my lesson… now my pantry is predominately glass jars, with some Tupperware here and there. 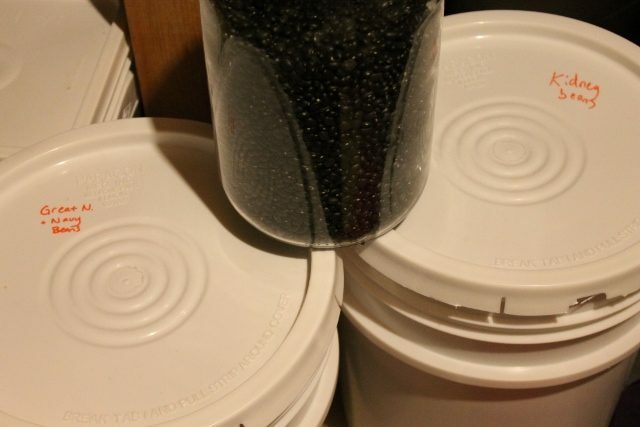 I like keeping my bulk grain purchases in 5 gallon “food safe” buckets I got from the hardware store. I have a friend who gets smaller plastic pails originally used for frosting from Costco’s bakery. You mentioned you arent storing your pasta in anything. 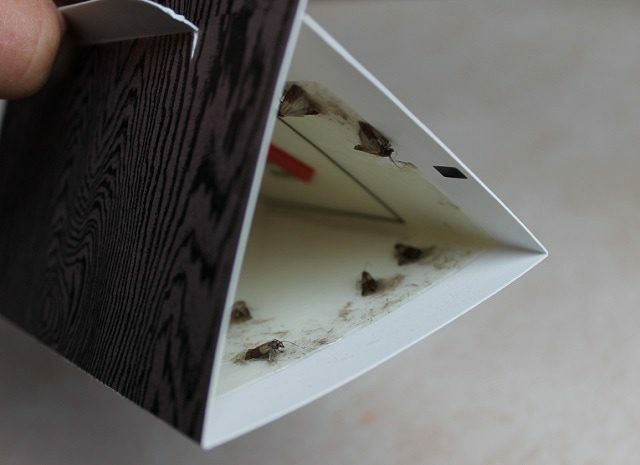 You might want to rethink that if you have already had a problem with pantry moths. I keep a very clean kitchen. Pretty ocd. I even had my spaghetti in a container that had a top where you clip down the four sides pretty securely. Then didnt make pasta for a while and one day i pulled it out of the cupboard and the container was full of those wormy guys. When I researched I found that you can just bring them home in the box from the store. Now all pasta goes into a freezer bag and directly into the freezer when we arrive home from the store. A pain but better than an infestation! I have found the best source for cheap (not free) glass jars. The Local Goodwill store! About once a month, i make a trip there. You’d be surprised what they have. I will usually spend around $30., but get somewhere between 12-20 nice glass containers. They range from the really nice bormoli type, with the clippy tops, to simple stopper tops, to tops you can buy corks for. Usually they are plain clear glass, but sometimes they have a raised pattern or maybe a ceramic painted top, but they sell for only $1-$3, and for containers that new would run at least $15….The bormoli ones, you just go to a local ‘mercantile’ type store (here it is called Down To Earth) and buy a bag of 6 new rubber rings for about $5. I have probably over 75 jars like this. I don’t mind they don’t match, and since, I too, am a bit OCD, that is pretty amazing to be able to say! I won’t store ANY food items in plastic of any kind., and I am super rodent afraid, so nothing that they can chew through like cardboard. I AM OCD about bugs and mice!!! Another place to get big glass jars is a sandwich shop like subway. They usually throw their empty pickle, pepperoncini and other jars away unless an employee recycles them. Might be worth asking managers for them with the lids on. Aieeeeee!!! I use a lot of hard plastic bins and things to hold most of my pantry staples. I like to keep nuts and flours in the freezer. We just moved so it was a good time to go through things. I basically tossed anything I kept in a plastic bag. I love your tips. It’s motivating me to go back through the pantry. Hard to muster up the energy for that one since it’s just this week that we’re feeling mildly settled.